On the shelves on the Blue Ice Café you’ll notice charming little pots of “Grønlandsk Honning,” or Greenlandic honey. 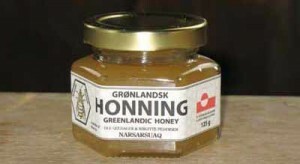 With its distinct fragrance of Greenlandic wildflowers, this honey has a real taste of Greenland. The nectar is gathered primarily from willow, wild thyme, bellflowers, fireweed and angelica. You can also buy it at the Qaqortoq Tourist Office or Hotel Narsarsuaq.